Uptil now, we have discussed quite a bit of algebra, number theory and calculus for RMO, IITJEE Main and Advanced Mathematics. Let us switch back to plane geometry for a while. In school, we all learn about tests of congruency of two triangles. But, have you wondered what is the exact meaning of “two plane figures are congruent”? Try to Google and find the answer for yourself. You can also post your answers as comments to this blog article. The reasons I discuss these are two fold: (1) do you know the proofs of these congruency tests? In schools, students are just taught the meaning of these and how to apply them. Well, I will give you proofs of these in my blog at some later time. (2) There are some nuances to these tests; when they cannot be applied, or rather, which *tests* fail to apply. 1)Two sides, and the included angle. (the SAS Test for Congruency of 2 triangles). 2) The three sides. (the SSS Test for congruency of two triangles. 3) Two angles and one side, the side given in one triangle CORRESPONDING to that given in the other (ASA and AAS Test for Congruency of two triangles). The two triangles are not, however, necessarily equal in all respects, when any three parts of one are equal to the corresponding parts of the other. 1) When the three angles of one are are equal to the three angles of the other, each to each, the fig 1 (attached, please download) shows that the triangles need not be equal in all respects. (If you recall, such triangles are called similar, not congruent because congruent means exactly same; two twins are similar, but not same). 2) When two sides and one angle in one are equal to two sides and one angle of the other, the given angles being opposite to equal sides, the fig 2 (attached, please download) shows that the triangles need not be equal in all respects. For, if $AB=DE$ and $AC=DF$ and the $\angle ABC = \angle DEF$, it will be seen that the shorter of the given sides in the triangle DEF may lie in either of the positions DF or DF’. $\angle DF’E$) or supplementary as (the $\angle ACB and \angle DFE$); and, that in the former case the triangles are equal in all respects. This is called the ambiguous case in the congruence of triangles. Note: ambiguous means that which has some uncertainty. In other words, there could be more than one possibilities. If the given angles at B and E are right angles, the ambiguity disappears. 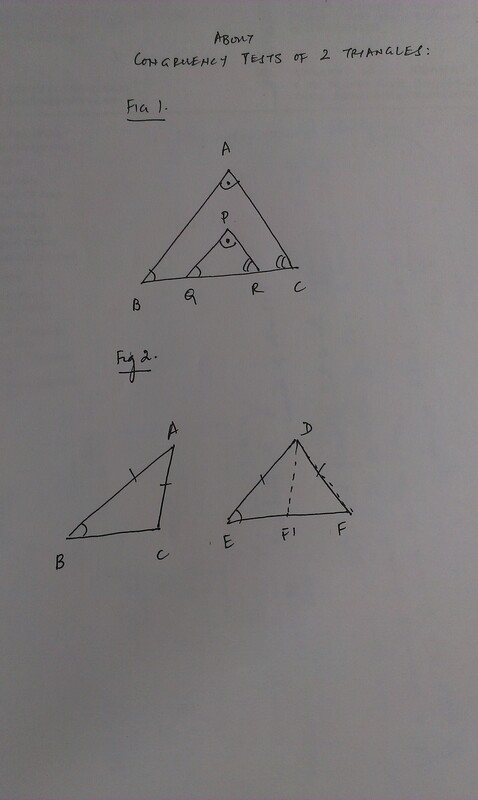 In the next few blog articles, we will discuss the proofs of congruency tests of two triangles. This entry was written by Nalin Pithwa, posted on November 22, 2014 at 9:32 pm, filed under IITJEE Foundation Math IITJEE Main and Advanced Math and RMO/INMO of (TIFR and Homibhabha) and tagged Basic Geometry, Basics of Plane Geometry, Euclid's Geometry, IITJEE Foundation Maths, Plane Geometry, Pre RMO, RMO Maths, test for congruent triangles. Bookmark the permalink. Follow any comments here with the RSS feed for this post. Post a comment or leave a trackback: Trackback URL.